There’s something supremely amiss. 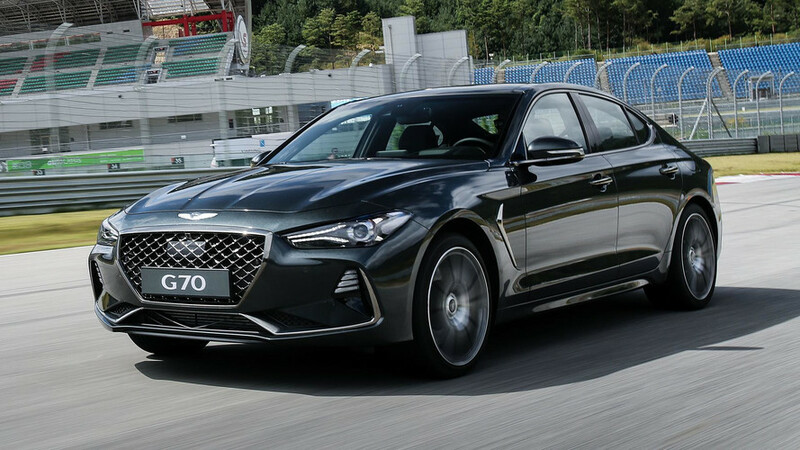 I’m behind the wheel of the 2019 Genesis G70 Sport, currently banking hard right on a sharp corner in the densely forested mountains a few hours northeast of Seoul. Internally I’m squealing a little, part giddy and part surprised that I’m part giddy. It’s as if I’m on a game show and I’m suddenly asked the money question: “what’s 2+2?” I obviously know what’s up but I desperately want to whisper-ask someone to confirm. 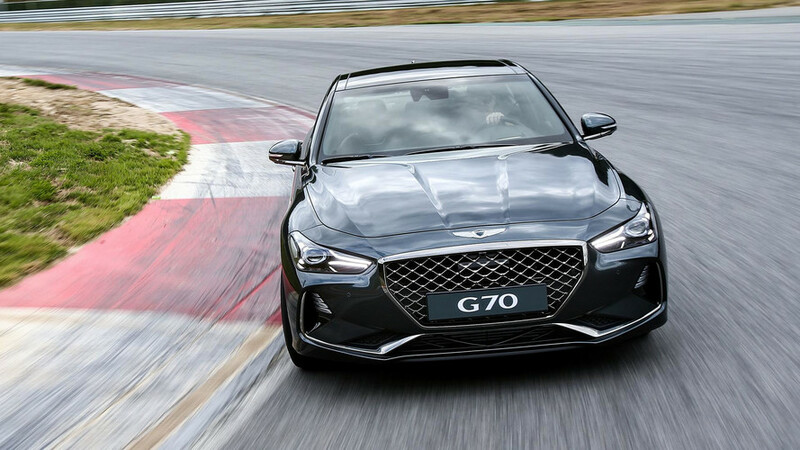 While Genesis will soon celebrate its second birthday, the 2019 Genesis G70 sports sedan ushers in the brand’s true launch party. 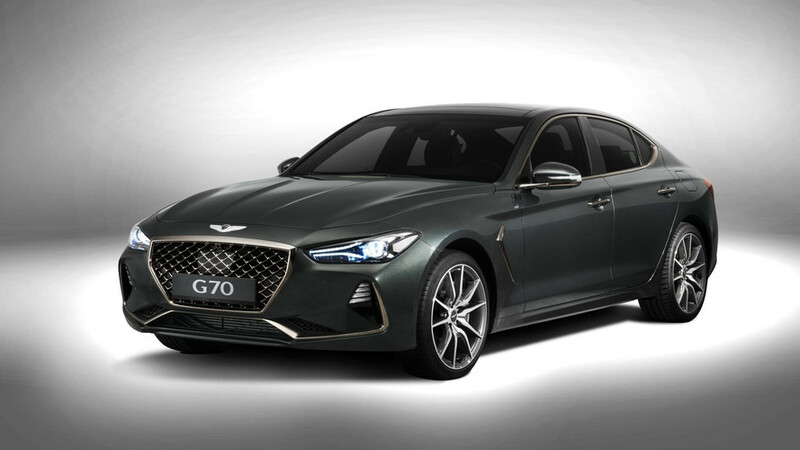 Arriving in America next spring, the G70 is the most accurate embodiment yet of what Genesis is, and it couldn’t have picked a more difficult segment in which to make a statement. The German standard bearers alone would be a Herculean task for a new upmarket automaker to compete with. While the BMW 3 Series hasn’t moved the design or innovation needles in some time, it’s still every bit a driver’s car. 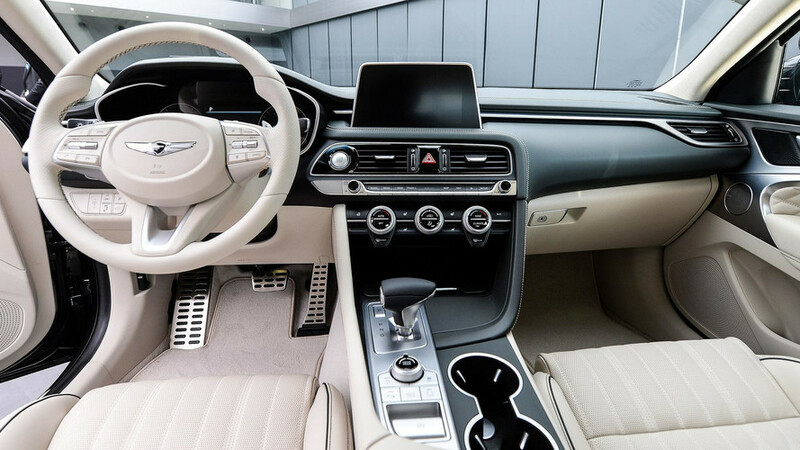 The interior of the Mercedes-Benz C-Class is segment-above, and the Audi A4 has found a happy medium blending style and performance. 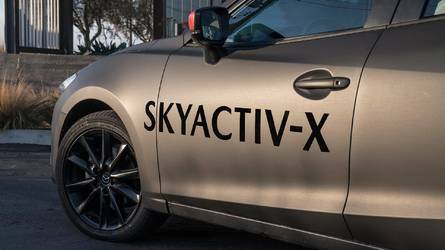 Other offerings such as the Lexus IS, Cadillac ATS, and even Infiniti Q50 complicate a purchase decision further. 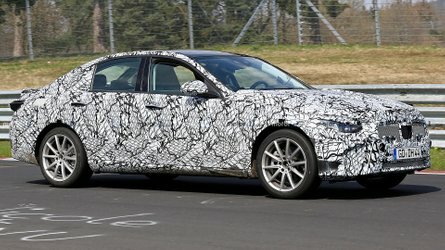 And there are newcomers too, such as the Alfa Romeo Giulia, a car that’s brimming with allure. Amid this environment, how is G70 expected to succeed? The G70 is the most accurate embodiment yet of what Genesis is, and it couldn’t have picked a more difficult segment in which to make a statement. Luckily for Genesis, the Koreans appear to have done their homework here. Part of that is enticing some of the most storied resumes in the biz to swap European addresses for Korean ones. Spice up the tried and true. Less butter more Kimchee, probably better for the gut anyhow. The head of the BMW M division – its chief engineer Albert Biermann – moved over to the Hyundai Motor Group before Genesis was officially its own brand, and oversees performance and development for Hyundai, Kia, and Genesis. 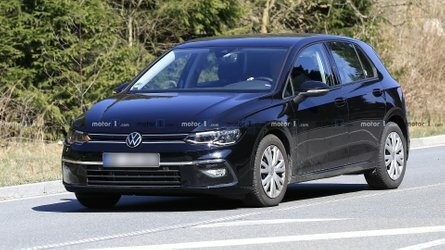 Former Lambo director Manfred Fitzgerald is now head of the brand. Luc Donckerwokle, of Bentley and Lamborghini fame, is charged with heading design. He has major help in Sangyup Lee, also of Bentley fame, and the designer of the C5 Corvette, among other notable projects. The newest addition is Sasha Selipanov, who took the lead role on designing the exterior of the Bugatti Chiron – which we quite enjoyed – and all of the designers will receive the yay/nay from Peter Schreyer, also formerly of the VW Group by way of Audi. It’s worth noting that aside from Schreyer and Biermann, the others could give later-stage input here, but development of the G70 was already underway. That said, where does this exactly leave the G70? It’s what we were wondering before the cover slipped off at the reveal in a newly minted Korean design center, the day before we got behind the wheel. Actually, we were genuinely curious about what it might look like. Somehow Genesis pretty successfully avoided image leaks. And then the covers were pulled back. Attractive, sporty, but also with strong cues from other players in the field. If you squinted a bit, you could see some Audi, Infiniti, and Bimmer inspiration. What was there, however, we liked. A new iteration of sleek LED headlights. Functional air intakes that help with brake disc cooling below the grille, which is surrounded by an elegant gold-chrome or a darker chrome finish. The “muscular tension” design language is most evident on the long, flared, and creased hood. The show cars sport 19-inch Michelin Pilot Sport 4s – confirmed for the U.S. and Canada – and feature Brembo brakes and multi-spoke alloy wheels. A “hockey stick” decorative element on the front profile adds a touch of flair. 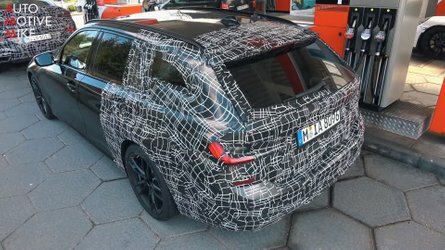 Things are decidedly more conservative in the rear, characterized by quad rear taillights and a slight lip spoiler that serves both a functional aerodynamic, and aesthetic purpose. Ten colors are available, including the striking Polaris Blue. Overall the car has presence, and can hold its own, style-wise. The interior was quiet aside from the speakers, with very little road noise and almost a complete absence of wind noise transmitting to the cabin. Most impressive in the driver-focused interior are the quilted seats, with prominently visible stitching and piping. The door panels even get the luxe leather quilting, and there’s a harmonious application of aluminum for the door handles. 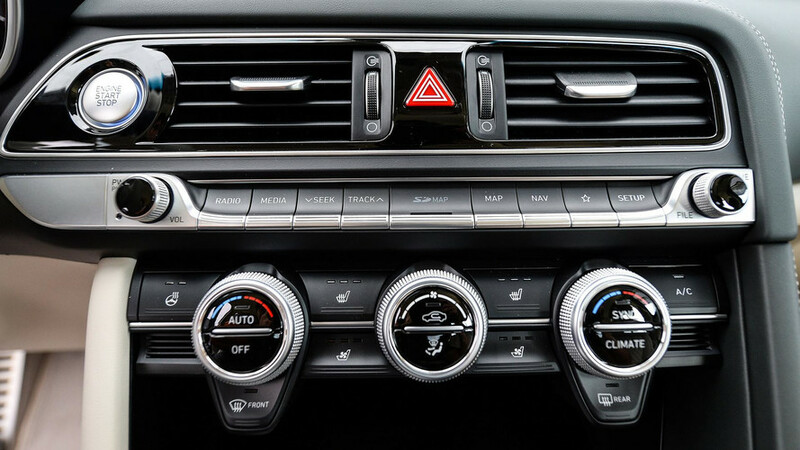 The dials for the climate and other controls offer a nice tactile feel, and the 8.0-inch touchscreen is modern with attractive graphics and high-resolution. Additionally, you’ll be able to use Apple CarPlay and Android Auto with it as well. A Lexicon sound system is available, and was featured on the models we saw. Visibility is good and there’s enough room for a moderately tall person to sit behind themselves. 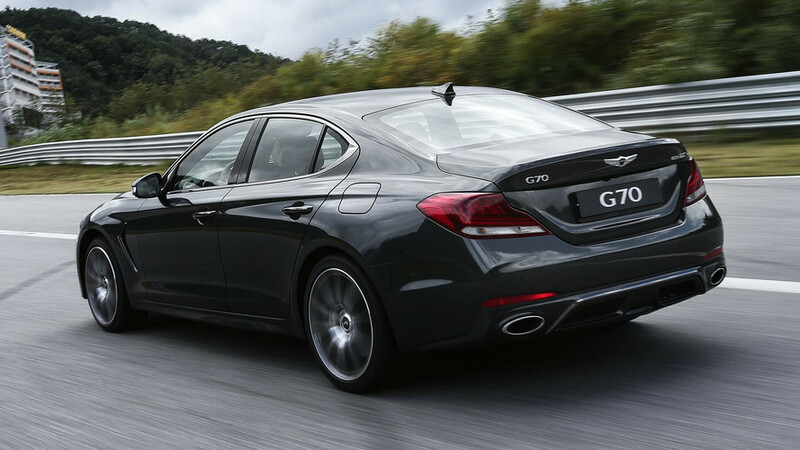 Following a familiar formula in the segment, the G70 offers a 2.0-liter turbo four-cylinder, and a bigger V6, in this case a twin-turbo 3.3-liter. It’s worth noting that some markets will get a 2.2-liter diesel, rated around 200 hp, but that’s not likely to come to the U.S. The 2.0T is unofficially good for 248 hp and 260 lb-ft of torque, while the 3.3T is rated at a brawny 365 hp and 376 lb-ft, which is considerably more power than a BMW 340i at 320 hp, and about the same as the Mercedes-Benz’s 362 ponies. 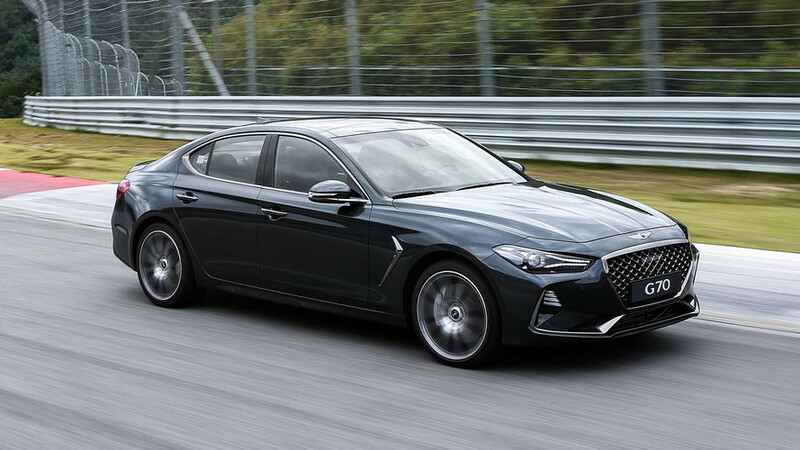 Genesis will offer both rear-wheel and all-wheel-drive versions of the G70, and all will be mated to an eight-speed automatic transmission with shift paddles. There’s the possibility of a limited manual transmission offering, but that’s still down the road. All of the feedback – from steering to chassis, grip to braking, gear shifts to nimbleness, all of it – is confounding and gratifying at once. 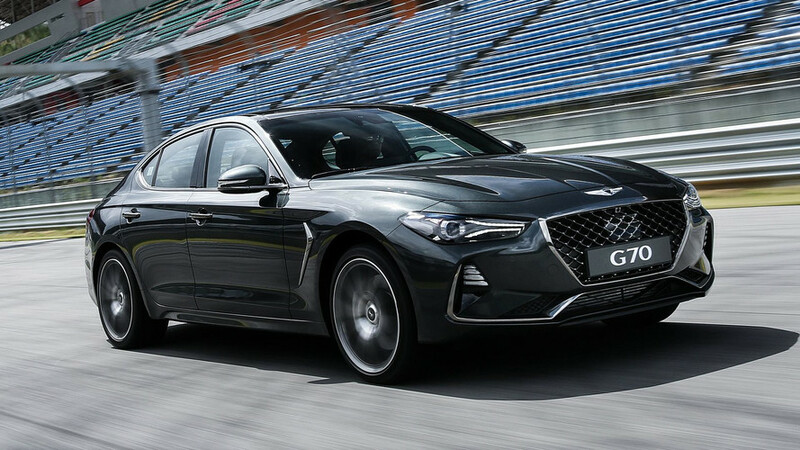 Seated in a 3.3T, I eagerly punched the throttle and felt an immediate jump; power at the ready, the meatier G70 has a bite. Unfortunately, I couldn’t bite my way out of Friday traffic, but the initial crawl helped me determine that the cabin was indeed a comfy and livable place in what are very real-world conditions for many. Once out in the country, it was a different story. In the first possible minute I opened it up. There are five driving modes, but there might as well be two. Smart, Eco, and Comfort all felt nearly identical in my limited time playing with them. I didn’t engage Custom, but that’s mostly because once I turned the dial to Sport, good things started happening. The throttle became looser, happier. Steering stiffened, and the sound that was being piped in through the speakers – Genesis engineered sound directly based on your throttle input – became decidedly more aggressive. One oversight is while sound work was done for those in the cabin, the car whooshes through the streets without the growl or rumble you might want. This might be a good attribute on the G90, where luxury is paramount, but I’d like to hear a genuine engine note belting out. It doesn’t have to be exceptionally sporty, but, something. One facet in which engineers really earned their pay was with noise, vibration, and harshness. 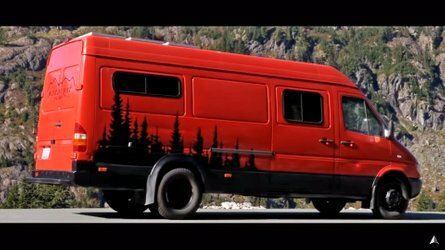 The interior was quiet aside from the speakers, with very little road noise – the chassis, which will be stiffened slightly for the U.S. market, did a great job soaking up road imperfections – and almost a complete absence of wind noise transmitting to the cabin. But the bigger payday should go to the engineers who worked on handling. Somehow, even after hearing the work that went into dynamics, you’re not quite convinced. But on those mountain roads, there’s a shocking amount of confidence you soon gain from the AWD system, and then the weird thing happens: you realize you’re pushing a Hyundai product and all of the feedback, from steering to chassis, grip to braking, gear shifts to nimbleness, all of it is confounding and gratifying at once. The braking is consistent and linear. The G70 is seemingly always ready to pounce. Can’t I just quickly, quietly confirm with someone what 2+2 equals? When I reach my destination, Inje Speedium (if I ever win the lottery, I’m going to get my own “speedium”), this is further confirmed. The track, which Biermann affectionately refers to as his “mini Nürburgring here in Korea,” boasts the turns, elevation change, and even a long enough straight to mash the throttle enough to realize the quick 4.7 seconds to 62 miles per hour that Genesis touts is the real deal, but not long enough to test the 167-mph top speed. You also realize that four quick laps is not nearly enough time with the car. I find myself reluctantly giving back my helmet, wanting just one more go before being ushered off to the next activity. 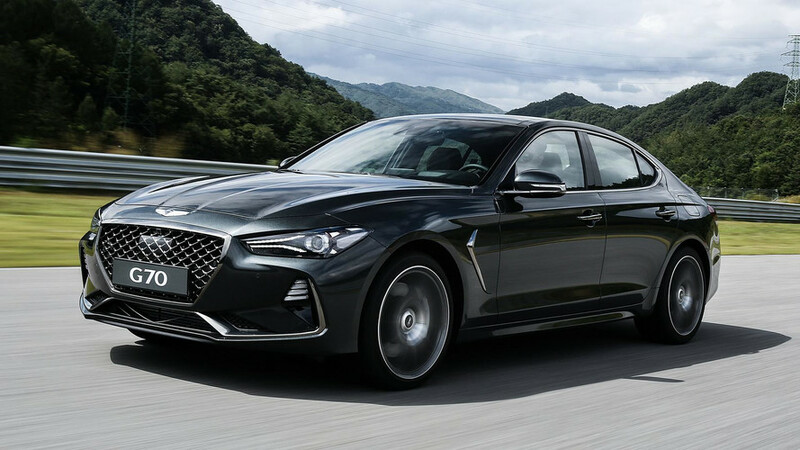 When it came to the 2019 Genesis G70, I didn’t really know what to expect. The G80 and G90 are good cars in their segments, and offer plenty to like. Was the G70 going to be a shrunken version of the G80? What I found was the best car to come from Korea yet. Attractive, sporty, and with a level of performance and capability I’m not used to associating with cars from the country. 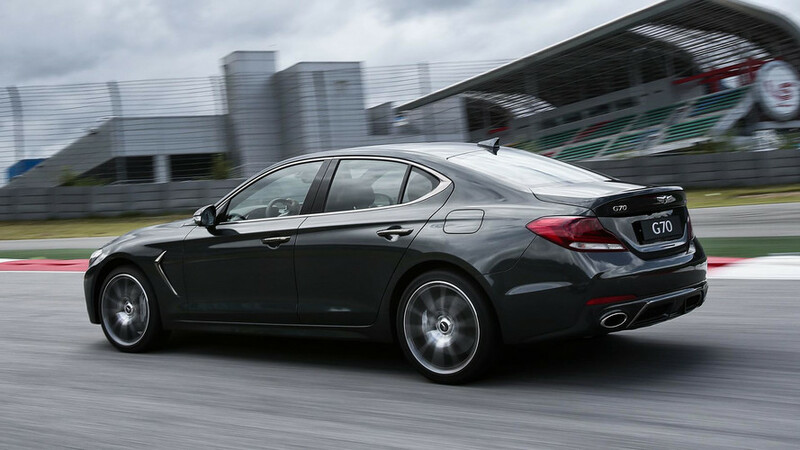 The G70 is the Genesis brand’s third car, with at least three more to come in the next four years. Pricing will be crucial. If Genesis gets that right, it will have a very alluring offering. And while I’m excited to see what’s next for Genesis, I’m already looking forward to more wheel time with the G70.